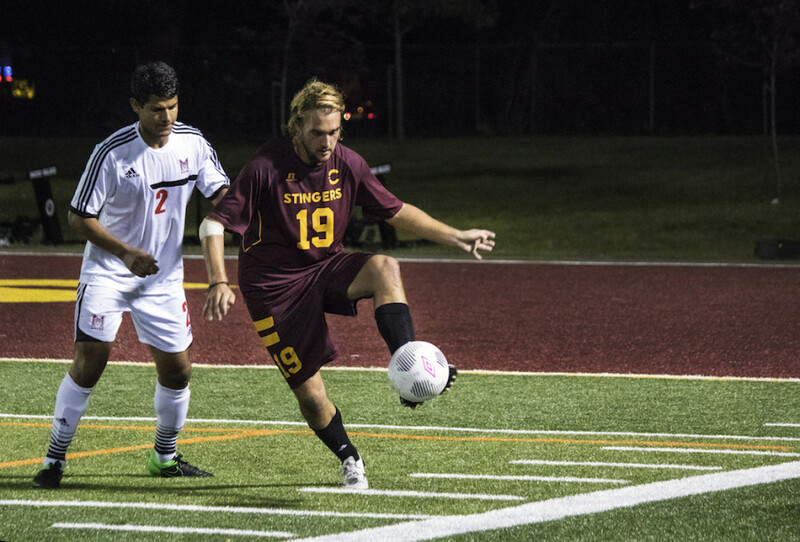 After a dream start to their 2015 campaign, the Concordia men’s soccer team has now suffered two consecutive defeats, including a 3-0 loss against Université de Montreal on Friday night. A week ago, the Stingers blew away McGill with a four-goal flurry, but were shutout last Sunday versus Université de Québec à Trois-Rivières and again on Friday by the Carabins. “We are feeling pretty down, I’ll be honest,” striker Mitchell O’Brien admitted after the game. The Stingers and Carabins took the field directly after the women finished, in front of a large crowd at CEPSUM. In the opening minutes, the Carabins tried to stretch the play with long balls down the flanks. It wouldn’t take long for a breakthrough to come. In just the ninth minute, the Carabins connected on several passes in the midfield that would ultimately free Fernando Herrera on goal. The second year midfielder took advantage of the chance, sliding the ball towards the left side of the goal and past Wes Aucoin. Set pieces were difficult to handle for the Stingers for a second straight game. In the 38th minute, Adama Sissoko was able to connect his head on a ball played in from a corner kick. Aucoin made the initial save, but Michelot Hyacinthe was in perfect position to bury the ensuing rebound. “Corners went really bad last game and so we practiced them this week. But I don’t know why [it happened again], I think it is a lack of discipline or something,” Olivier Georges explained. “People are always expecting others to pick them up and to do their jobs. They scored on us [off a corner] and it really got us down because we knew had a tough time on that [last game] and they got us,” he added. Just before the halftime whistle, the Carabins struck again to open their lead to three goals. Sissoko fed Mircea Ilcu with a perfect through ball and the Romanian striker made no mistake from close range, scored the final goal of the game that ended at a score of 3-0. Sutton also echoed his captain’s same thoughts in regards to problems concerning set pieces. The men’s team now has a full week break before they resume next Friday at home versus Sherbrooke. The Vert et Or are winless thus far and have conceded nine goals in two games. Sutton fully realizes the importance of garnering a home win versus the Vert-et-Or. “We have a long week because we are off Sunday and then we have, almost what you would call a must win game, next Friday against Sherbrooke,” he said.